First of all, it is absolutely terrible news what happened in Colorado at the midnight screening for TDKR. The Verbal Mosh would like to express our condolences to all of the victims. 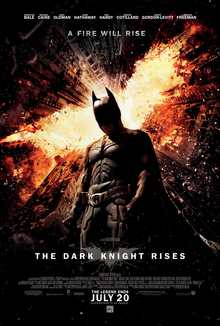 Starring Christian Bale, Anne Hathaway, Tom Hardy, Gary Oldman, Morgan Freeman and many more. We saw the movie Friday morning. We were the first ones in the theater, which was so cool, but it didn't take long for people to start filing in after us. The movie had so much going on in it. It's a lot to process. For the most part, the pacing was good. The action was great, and so was the plot. Batman had retired after the death of Harvey Dent. He felt that Gotham didn't need him anymore. Crime was down because of the "Dent Act." Rumors of a mercenary named Bane was starting to reach Bruce Wayne, and he felt it was time to slowly get out of retirement. Another catalyst for his action was crossing paths with Selina Kyle aka Catwoman (though they never call her that in the movie. They do refer to her as a cat burglar), who had stolen his mother's pearl necklace and his fingerprints. The point of the fingerprints was to gain access to Wayne Enterprises and the machine within that could harness nuclear energy and in the wrong hands, be turned into a bomb. They stated in the movie that this was a time bomb. That no matter what, even if Bane's "revolution to give Gotham back to the people" fails, the bomb would go off. The only way to stop it was to set it back into its reactor. So, it was confusing that there needed to be a trigger man. The trigger man was there as a threat that the bomb could go off at any time if anyone stepped a toe out of line (or out of Gotham, more to the point.) So, it was weird that the trigger needed to be pushed at the very end of the alloted time frame because at that point it seemed a little redundant. Batman fights Bane and gets beaten to a pulp. The image of Bane holding Batman above his head was very reminiscent to the comics and it made me think of when Bane broke Batman's back and paralyzed him. Luckily, we didn't get an Azrael in his place and Bruce's back just needed a little realignment. There were a lot of cool characters. I enjoyed seeing Crane come back, this time as the judge sentencing either death or exile... which is basically death, too. Michael Caine as Alfred was fantastic. He nearly made me cry with his performance. Ra's al Ghul came back, but more intriguing was seeing Talia. I was wary because I thought for film purposes, they were going to make Bane Ra's al Ghul's son, but thankfully that wasn't so. I'm happy to see more characters get introduced into the film. If only things worked out for Talia, there'd be the perfect set-up for Damian to eventually appear. Robin was there. He has a background that somewhat reflects Bruce's life. He realizes who Bruce Wayne/Batman is early on because they are similar and they both know what it is to pretend to smile and fit in to cover the anger they feel from the injustice of the world. Talia's death scene was really awkward. It felt abrupt but I think that had to do with the pacing of the film. They needed to keep the story moving, plus who would mourn over her? Bruce was already moving on to Selina. I'm still not crazy about Anne Hathaway's performance as Catwoman, but it wasn't as bad as I thought it would be. The reveal about Talia and Bane was fantastic. It was creepy and intimate. Batman heals physically and is prepared mentally to fight Bane. It was weird how easily he got back into Gotham, but everyone was more concerned about making sure no one left, I guess they weren't going to pay any mind to someone trying to get in. Batman's "Bat" and motorcycle were so cool. I liked how the wheels could turn and change direction so quickly. The Bat looked more like a bug, but I'm not complaining. It was cool. I liked how Bane didn't look like some guy jacked up on steroids. He was a man. A ferocious fighter. It made the fight scenes between him and Batman more believable and captivating because it would seem like Batman should be able to take down this guy, but Bane was too fast, too powerful and too skilled. There were a lot of great lines in the film and one of my favorites was the one where Bane talks about how Bruce merely adopted the dark, while Bane was born in it. This was a great film. My favorite comic book film of the year. I could go on and on because there are so many interesting details to note. I like how this film rounded out the trilogy. It felt complete. There was closure. And within itself, it came full circle with Alfred and Bruce (and Selina) at the restaurant finally "moving on" with Bruce's life. The Dark Knight Rises gets two thumbs up from me.